With regular maintenance and careful cleaning, you can keep your laminate floor looking shiny and new. Laminate floors are so beautiful when first installed, but over time they can start to look a little worse for wear. Of course, unsightly streaks and blemishes need not be permanent. By following these simple guidelines, you can clean laminate floors effectively and restore their original sparkle and luster. If you’re going to coexist happily with this particular flooring material, then you’ve got to know one thing: Laminate hates water. If you allow the flooring to get overly wet, then the installation may warp as moisture seeps between and under the boards. That said, mopping is often the best way to clean laminate floors. So how the heck do you mop the laminate surface without putting it in jeopardy? 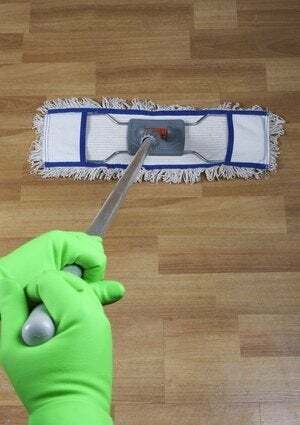 • Use a flat mop and wring it out often; it should remain damp but never make contact with the floor when dripping wet. • Working in sections, use a spray bottle to mist the floor, then promptly go over with a dry mop. If the floor still looks wet a minute after you’ve mopped it, that means you’re probably using too much water. When plain warm water doesn’t cut it, consider using a store-bought commercial cleanser. Take care in making your product selection, however. Some chemicals in common floor cleaners can damage laminate, so it’s prudent to double-check the packaging to be certain you are purchasing something that’s laminate-safe. Also, remember that using twice the recommended amount won’t render the floor twice as clean. Rather, the excess leaves a streaky, cloudy residue that actually makes the floor look dirty. For a tough stain that neither water nor floor cleaner can budge, try an acetone-based solution, such as nail polish remover. Apply it directly to the stain, in as small a quantity as possible. Once the solution has done its work, wipe it away with a soft, clean cloth (not with a scouring pad or anything else that could leave scratches). Another good thing to know: If you’re trying to remove a hard, stuck-on substance like wax or gum, harden it first with an ice pack, then scrape it away with a plastic putty knife. The least demanding, most reliable way to clean laminate floors is through light but consistent maintenance. Once a week—or as often as traffic in the room demands—sweep or vacuum the floor to control dust and debris. Given the sensitivity of laminate floors to moisture, wipe up spills swiftly after they occur. 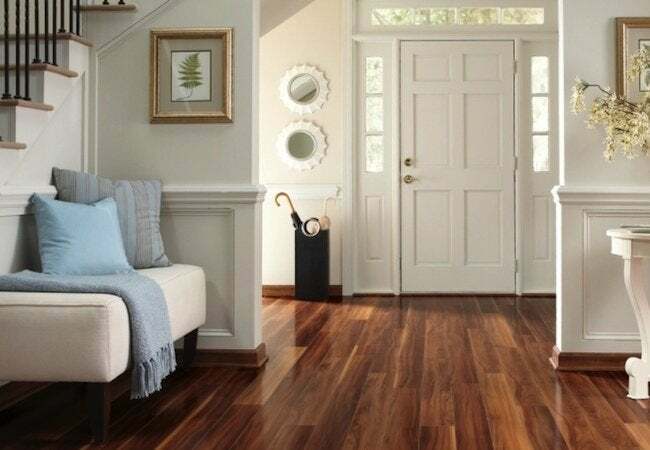 Laminate floors shown in magazines and catalogs always shine brilliantly, don’t they? Well, yours can too! Once you’ve managed to get the floor clean, follow up with a soft cloth (or an old T-shirt) and buff the surface using circular motions to achieve a gleaming polish.